2015 TOYOTA SIENNA LE, 8 PASSENGER, ONE OWNER, CLEAN AUTOCHECK HISTORY REPORT, AUTOMATIC TRANSMISSION, POWER EQUIPMENT GROUP, AND MUCH MORE. PLEASE CONTACT EGOLF MITSUBISHI SALES AND SERVICE @ 828-694-3600 FOR MORE INFORMATION AND TO SCHEDULE YOUR TEST DRIVE TODAY @ 1325 SPARTANBURG HIGHWAY, HENDERSONVILLE NC 28792. FINANCING AVAILABLE FOR ALL CREDIT TYPES!!. Roomy, comfortable and offered in several different trim levels, the Toyota Sienna minivan is an excellent choice for families. And the changes for 2015 have made it even better. For 2015, the Toyota Sienna gets a refresh. It doesn't look much different on the outside (updated grille and taillights), but under the skin there's a revised suspension, a stronger body structure and welcome improvements to the interior's design and materials quality. Available eight-passenger seating; comfortable and far-sliding second-row seating; high-quality interior; user-friendly controls; available all-wheel drive. You're not likely to buy a minivan to make a fashion statement. A box on wheels just doesn't lend itself to sleek, Jaguar-esque proportions, you know? But if you need something to expertly haul your family, your stuff, or your family and stuff, you've come to the right place in checking out the updated 2015 Toyota Sienna. Previously, we've lauded the Sienna for its comfortable seating and both strong performance and respectable fuel economy. That continues to be the case for 2015. However, we were previously turned off by the interior's odd dash design and hard, cheap-feeling plastics. For 2015, Toyota has righted those wrongs with a new more user-friendly dash and nicer interior trim. Updated for 2015, the Toyota Sienna is one of top recommended minivans. It comes in many trim levels, including this SE. You might also notice the 2015 Sienna's subtly updated front and rear exterior styling, and those improvements don't just end at the surface. Toyota says it also strengthened the body structure and retuned the van's suspension to improve ride comfort as well as handling. We've driven this year's Sienna and can report that it is indeed a more secure-feeling and comfortable minivan to drive. In previous years, we always recommended the SE version of the Sienna, as it offers the sharpest and most carlike handling of the Sienna line. It returns for 2015, but now the SE is available with more equipment, meaning you no longer have to forgo desirable creature comforts if you choose the sportiest model in the Sienna family. Meanwhile, the continued availability of all-wheel drive ( the Sienna is the only minivan that gives you this option for 2015) is another bonus if you frequently deal with snow or wet road conditions. With all these points in its favor, the 2015 Toyota Sienna is one of our top recommended minivans. Our other favorite is the equally impressive 2015 Honda Odyssey, and we definitely recommend cross-shopping both of these all-stars. You might also want to check out the redesigned 2015 Kia Sedona, the off-beat 2015 Nissan Quest and the value-oriented Dodge Grand Caravan, especially if you want a van that can be more easily converted to carry lots of cargo. Overall, though, we think you'll be very happy with Toyota's latest version of this family-friendly box on wheels. The 2015 Toyota Sienna minivan comes in five main trim levels: base L, LE, SE, XLE and Limited. The SE, XLE and Limited are further available in "Premium" sub-trims. The LE and XLE come in seven- and eight-passenger configurations; the L and Limited versions are seven-passenger only and the SE is eight-passenger only. All trims come standard with front-wheel drive, but the LE, XLE and Limited also can be had with all-wheel drive. These rear captain's chairs are luxurious, but larger families will prefer an eight-passenger Sienna with bench seating. The sport-themed SE is equipped similarly to the LE but adds more aggressive styling thanks to 19-inch alloy wheels, a unique front fascia (with foglights, LED running lights and mesh inserts) and lower-body skirting. The SE also has sportier suspension tuning, a power liftgate, perforated leather upholstery (for rows one and two; row three gets leatherette premium vinyl), heated front seats and unique gauges with a larger multipurpose display. The SE Premium adds a sunroof, keyless ignition and entry, blind-spot and rear-cross-traffic warning systems, a navigation system, Entune smartphone app integration, a rear-seat entertainment system (with HDMI inputs, RCA jacks, a DVD player and a large screen that can be split to display two different sources) and the Driver Easy Speak system, which broadcasts the driver's voice through the rear speakers. The Sienna XLE shares many of the SE trim's comfort and convenience equipment, but features similar suspension, steering and styling to the LE. The XLE and XLE Premium, however, differ with a four-way power front passenger seat and power-opening rear quarter windows. When equipped with the seven-passenger seating configuration, the second row captain's chairs feature extendable foot rests. The plush Limited includes the XLE Premium's features (minus the rear-seat entertainment system) along with 18-inch alloy wheels, a different grille, LED running lights, auto-dimming and power-folding outside mirrors, front and rear sunroofs, front and rear parking sensors, upgraded leather seating, driver memory settings, a heated steering wheel, a power-folding third-row seat (FWD only), a navigation system and an upgraded 10-speaker JBL surround-sound audio system. To all that, the Limited Premium adds automatic wipers and the rear-seat entertainment system. This is the larger of the two available touchscreen interfaces, and it includes integrated smartphone apps. Although some of the upper trims' features are available on lower trims as individual options, most optional features are grouped into packages that vary based on trim level and where you live in the United States. For the Sienna Limited only, the Advanced Technology package adds adaptive cruise control and a forward collision warning system. Every Toyota Sienna comes with a 3.5-liter V6 engine that delivers 266 horsepower and 245 pound-feet of torque and drives the front wheels through a six-speed automatic transmission. The Sienna LE, XLE and Limited models can also be equipped with all-wheel drive. In Edmunds testing of last year's model, a front-drive Sienna Limited went from zero to 60 mph in a swift 7.5 seconds. The EPA fuel economy estimates come in at 21 mpg combined (18 city/25 highway) for front-wheel-drive versions. Opting for all-wheel drive drops those estimates to 19 combined (16/23). Antilock disc brakes, stability and traction control, front-seat side airbags, full-length side curtain airbags, a driver-side knee airbag, a front passenger seat cushion airbag, active front head restraints and a rearview camera are standard on all 2015 Toyota Sienna models. Blind-spot and rear cross-traffic monitoring systems and front and rear parking sensors are available depending on the trim level. The Limited can be had with a forward collision warning system. At our test track, last year's Sienna Limited stopped from 60 mph in 127 feet, which is about average for the minivan segment. In government crash tests the 2015 Toyota Sienna received five out of five possible stars, with four stars for overall frontal crash protection and five stars for overall side crash protection. In tests by the Insurance Institute for Highway Safety, the Sienna earned a top score of "Good" for its performance in the moderate-overlap frontal-offset, side-impact, roof-strength tests and head restraint (whiplash protection) design. It received the second highest rating of "Acceptable" in the IIHS test for small-overlap frontal-crash protection. Lower trim levels of the Sienna are attractively decked out with high-quality fabric upholstery, while higher-end models get leather along with simulated wood cabin accents. Materials quality is very good, and the new dash design is both more attractive and more functional. Seating is plush, and there's abundant storage space along with user-friendly controls. On the electronics front, every Sienna comes with a user-friendly Entune touchscreen interface. Each features a similar easy-to-decipher menu structure, but their screen size and the design of their surround buttons can differ along with the number of features they control. These include a navigation system and a suite of smartphone-connected services. There's also the available rear-seat entertainment system, which features a split-screen monitor that allows two different media (a movie on one side and a video game on the other, for example) to play simultaneously -- thereby making it easier to satisfy your backseat occupants. The eight-passenger Sienna comes with a 40/20/40-split second-row bench, and its center section slides close to the front seats for easier access to the little one seated there. It can also be removed and stowed within the van itself (unlike the Odyssey's, which you must find a place for elsewhere). With a seven-passenger Sienna, you get specialized second-row captain's chairs. Although their available La-Z-Boy-style footrests will likely catch your eye during a test-drive, you'll also likely be impressed by their ability to slide quite far fore or aft to increase sprawl-out comfort or cargo space. Maximum cargo space stands at 150 cubic feet of cargo space, though to achieve this you have to remove the second-row seats, which are quite heavy and awkward to remove. You can fit four suitcases or a large stroller behind the third-row seat, while storage wells corral smaller items. We've long been impressed by the Sienna's V6 engine and how it delivers lively acceleration whether you're bopping around town running errands or getting up to cruising speed on the freeway. 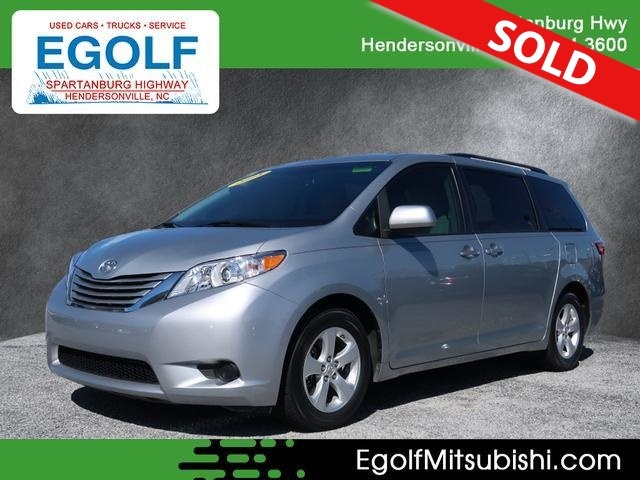 The six-speed automatic transmission does a great job of keeping the engine's thrust on tap, yet the Sienna still manages to provide respectable fuel economy, provided you're not too aggressive with the gas pedal. The Sienna's ride quality is plush, but more controlled for 2015, and all versions offer competent handling. The SE's recalibrated suspension and steering give it even more agility around turns. If you're used to driving a car, the SE should make the switch to a minivan a bit easier. Its ride is somewhat firmer, but certainly still comfortable.